Your business is serving your customers ... but are they really happy? 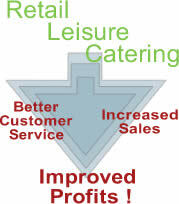 Here at Retail insight we are passionate about good customer service and are proven experts in creating real sales improvement for clients in the retailing, catering and leisure sectors. We will identity sales opportunities for your business, reveal why customers are not returning or recommending you, score your performance against that of competitors, assess your team's service levels and analyse operational efficiency. In practical terms we do this through a combination of mystery shopping, customer satisfaction surveys and sales improvement consultancy. Our expertise covers a wide range of key retail areas such as sales skills, store layout, merchandising, stock control, motivation, risk assessment, security issues as well as health and safety laws. Want to JOIN our Mystery Shopping team? © Retail Insight - all rights reserved - Web Development by FL1 Solutions Ltd.